Pictured are the clergy from various churches that were honored, along with the Rotary Club members who invited them. Rotary Club of Chattanooga Hamilton Place members invited their respective clergy to attend their annual Clergy Appreciation Day event. 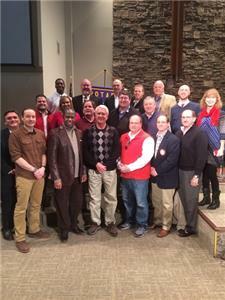 "One of the most treasured traditions of the Rotary Club of Chattanooga Hamilton Place is setting aside time to honor and show our appreciation to the clergy that are so meaningful to us," officials said. Jason Leonard, pastor of the House Ministry at UTC, was the featured speaker. Pastor Leonard shared the Biblical perspective of work and the importance of a strong work ethic in order to serve a meaningful life. "Work is good intrinsically and good for one's self worth and dignity," he said. He stated there are two ways to understand the impact of work; 1) work displays how we can help others; and 2) work provides a desire to serve and meet a human need.